I did not get much chance to look around the rest of the show, because I was standing and demoing for eight hours. That laptop in front of me? Didn't open it once. I thought I would be able to work on some HL code during slack time in the show. Ha ha. But I could see some very nifty first-person 3D exploration games running across the room, and hear the shrieks of Conway's Inferno. (All my puzzle friends noted Conway's Inferno as a clear puzzle hit; I agree. When the iOS version ships, buy it.) And I got a few minutes to chat with Jason Scott before he showed his movie. I hear Peter Molyneux dropped by, but if I saw him, I didn't know it. I did not win one of the show awards, which were voted by the crowds. (Didn't expect to.) You can see Shade got a string of yellow dots -- votes for "best narrative" -- although, to be fair, I think a couple of people were voting for Meanwhile. I don't see the winner list posted, but I know that the Best Narrative trophy went to Resonance, so congrats to Wadjet Eye. The show will happen again; it will be bigger next year. 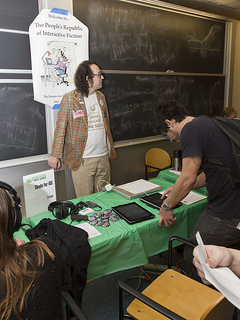 If you're a game maker in the New England area, and you're not big enough to set up a gigantic booth at PAX or GDC, you want to be at BostonFIG in 2013. I will be. This entry was posted in Boston and tagged boston, conferences, if, interactive fiction, meanwhile, shade, zarf, zarfhome. Bookmark the permalink. Oh, I nearly forgot the weird punchline: the Governor has proclaimed September 22 to be Independent Game Development Day in Massachusetts. I have no idea what sort of chain of events leads these things to happen, but I was there.